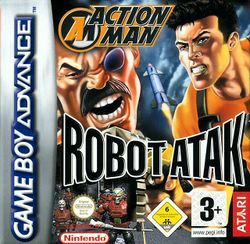 Action Man: Robot Atak is an action game for the Game Boy Advance, developed by Magic Pockets and published by Atari on September 24, 2004 in Europe. The game is based on the British direct-to-television movie Action Man: Robot ATAK, released in the same year as the game. The was spawned from the British cartoon Action Man, which was in turn based on the Hasbro toy of the same name first sold in 1990. Action Man is a member of an elite multinational task force who is trying to unlock the mystery of his past. Action Man has been framed for the kidnapping of a famous scientist, and the culprit is the mysterious No Face. At the same time, Dr. X has been resurrected and plans to take over the world with mind-control gas and his vast robot army. With the help of RedWolf and Flynt, the other members of the Action Force Team, Action Man must go into the heart of enemy territory—Island X! This page was last edited on 21 May 2010, at 13:21.